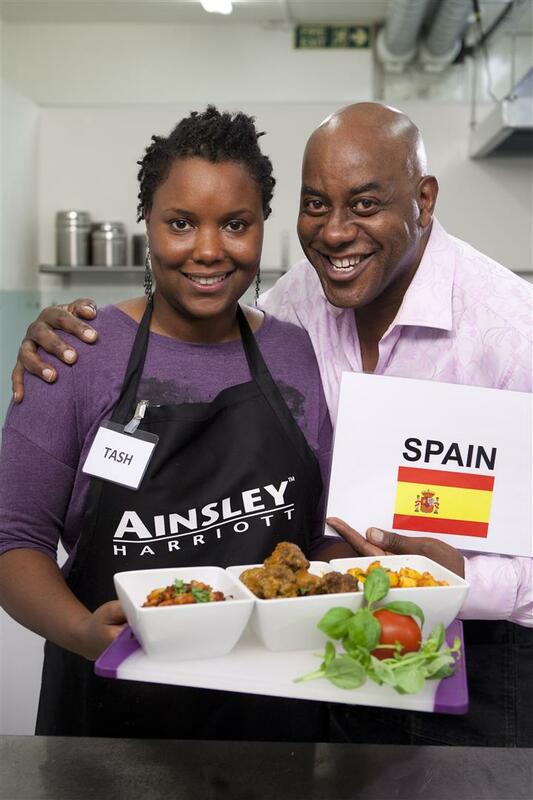 Ainlsey Harriot’s Soup Search Challenge – Vote for Spain! Ainsley is probably most well known for presenting the very popular show ‘Ready Steady Cook’. He came across as an excitable, friendly and full of character guy then, and now having met him, I can truly say that he’s just the same in real life. Our meeting came about as myself and four other bloggers were asked to take part in a challenge. 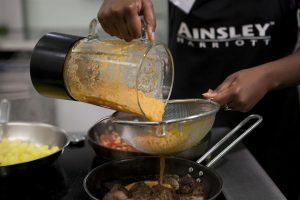 Ainsley is looking to launch a new Cup Soup flavour and is giving one of us bloggers a chance of doing just that. 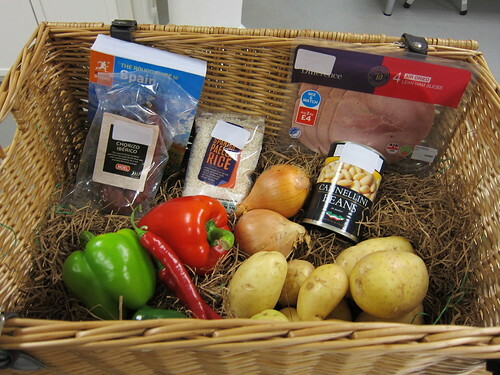 We were randomly given a country and a hamper full of ingredients to come up with something inspired by that Country. We didn’t know what country each other had until the last moment. I got SPAIN! Yeah! And I’m so excited about it, as I love, love, love Spanish food. The other fabulous bloggers got: Belleau Kitchen – Argentina, My Cooking Hut – Japan, Rachel Cotterill – Turkey and TikiChris –Vietnam. It will go to a vote, and the blogger with the most will get to go and spend a week exploring that country, with the aim of coming back to then develop a new Cup Soup flavour inspired from their travels . How cool is that? So please vote and send me to Spain! Oh, and there’s something in it for you too, by voting you will be entered into a draw for a chance to win a trip to Marrakech! So what are you waiting for? Details on how to vote HERE (nb. the app will only work on a computer/laptop – not through iphones etc.). And here are the recipes that I came up with to tempt you. 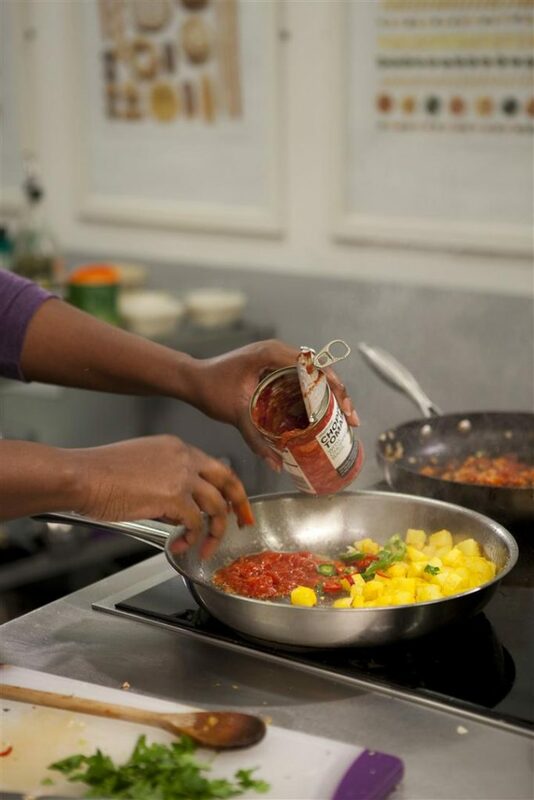 We were able to use a few store cupboard ingredients and given 30 minutes to cook! 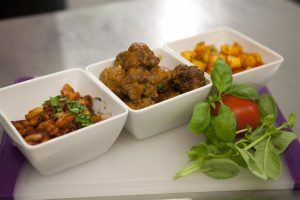 After much deliberation I came up with: Tash’s Tapas Trio. First up you will need three frying pans and one saucepan. Peel and dice potato (about 2cm), put saffron threads in a saucepan of salted water, add potato and boil for 5 mins (or until soft). Once cooked, drain and set aside. 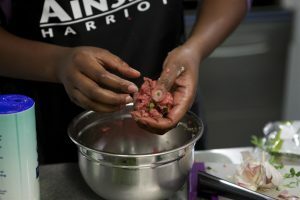 Put minced beef in mixing bowl and add, salt and pepper, garlic, parsley, thyme, egg and breadcrumbs, mix until combined then shape into little balls. 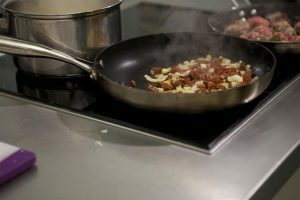 Heat the three frying pans with olive oil; add chopped onion, garlic and chorizo to one; drained potato in the second (and fry on a high heat), and the meatballs in the third. Blitz the red and green pepper in a blender with a little water. Once the meatballs have browned sieve the peppers and place the liquid in the meatballs pan (sieving the skin prevents the peppers from tasting bitter) , and stock cube, a little water and simmer until cooked. Add cannellini beans, tomatoes, parley, wine and tomato puree to the chorizo pan and simmer for 10mns. Plate each dish separately and enjoy! Good Luck Tash and may the best recipe win… and here’s wishing they send us all!! Your dishes look gorgeous, thanks for sharing your recipe…I’m feeling really hungry now! Thank you, had lots of fun making them.